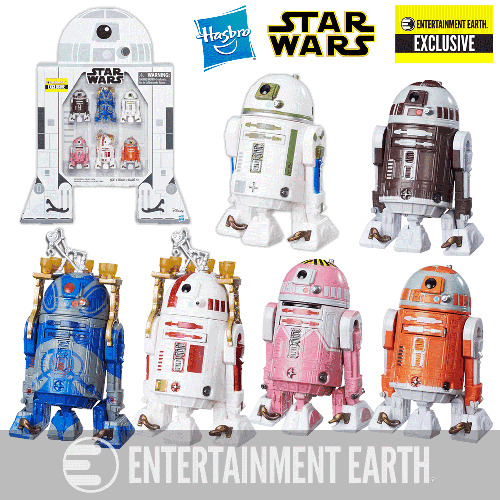 These figures come packaged in a huge R2-D2 shaped box - it stands over 16-inches tall! Both Jabba's bartender and R2-C2 include a drink dispenser, drink tray harness, and seven glasses for your alien figures! Entertainment Earth Exclusive! These figures will make your diodes tingle! The droids you are looking for are here. Celebrating the entire Star Wars saga and the 10th anniversary of our super-popular, sold-out, 2006 exclusive astromech droid sets, this amazing new Star Wars action figure gift set will knock your socks off! The sextet of astromech droids comes to you in a specially designed R2-D2-shaped box featuring these six 3 3/4 -inch scale action figures. Each droid sports multiple points of articulation, similar to the collector-favorite figures of The Vintage Collection. Dating back as early as the 1977 version of the original Star Wars movie, and all the way to the recent The Clone Wars animated series, this set has robots with personality you won't want to live without. Each figure includes rolling wheels on their feet, plus jointed domes, ankles, shoulders, and maybe even a few other surprises. Jabba's bartender was never given an official name in the books or movies, but his design may remind you of some Earth-based beverages. With his drink dispenser, seven glasses, and a tray harness, this never-before-fully-seen droid served aboard Jabba the Hutt's sail barge. Also, if you look to the shadows, you may find him in Return of the Jedi. We recommend skipping the shadows and getting one of our droids to keep on your desk and another in your Jabba's palace dioramas and playsets (sold separately). Serving the Shadow Squadron during The Clone Wars, R7-F5 appeared briefly in the episode "Shadow of Malevolence." Ideally suited for a Y-Wing bomber, this diminutive orange droid will look fantastic with the rest of your Grand Army of the Republic, or in your droid pool. Think pink with D-Squad's own QT-KT. Aayla Secura's pink droid had a special magnet and was sent into enemy territory to recover a secret encryption module for the Republic. Take special note of the top of her dome, as there are yellow and black markers indicating where special upgrades were placed during her time as a spy. You can meet her during several episodes of The Clone Wars. Plo Koon's R7-D4 makes his movie action figure line debut here! He's a dark maroon color with a gray and white highlights. This droid makes six appearances on The Clone Wars. Everything's gonna be all right with R2-C2 and a moon pie. We expect you may find both in the home of Black Sun crime lord Ziro the Hutt. This dapper dispenser of potent portable potables is decorated with Black Sun tattoos in gray, blue, and red. There are no other robots quite like him in the galaxy, plus he includes everything you need to help aliens get their drink on at a snazzy underground party. You'll find him in The Clone Wars movie, but the toy can only be found here. Rounding out the collection is R2-A5. If he looks familiar, he should. You first saw him in 1977! This white and green robot was seen rolling around Mos Eisley near Luke's landspeeder when the Imperial Sandtroopers and Stormtroopers came to ask about various droids they were looking for. You know how that story ends, but did you also know that this figure represents a droid design that was removed from the movie during the Special Edition edits of 1997? It's true! Bring home a lost piece of movie history with this remarkable figure and the entire exclusive action figure set. Ages 4 and up.